As electric vehicles become more commonplace, the automotive industry is coming up with new ways to evaluate and compare performance. There are a lot of ways to evaluate an EV, and they tend to be different from the way we’ve always evaluated performance and economy. You can look at range, obviously, and battery capacity or charging time. This list ranks 10 of the top EVs for 2019 in terms of their miles per gallon of gasoline equivalent, or MPGe. This figure is not widely understood, but it calculates the energy consumption of an EV as if it were using gasoline for fuel. Several factors go into the calculation, but it’s a convenient shorthand for how energy efficient an EV is. Here are the top 10 EVs with the best MPGe ratings in ascending order. 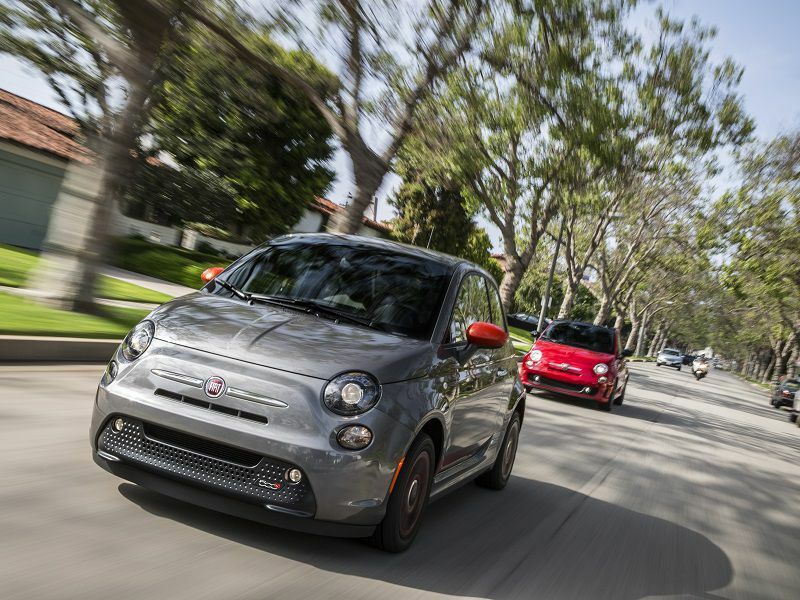 The 2019 Fiat 500e is rated at 121 MPGe in the city, 103 on the highway, and 112 combined MPGe. This car is a fun little subcompact EV that offers two doors, seating for four, and hatchback convenience. Features like a dashboard charge indicator and comprehensive driver information display make managing the 500e as easy as any gas-powered car. Comfort and tech features in the Fiat 500e include GPS navigation, heated seats, and satellite radio. A large sunroof is optional. The 500e starts at $33,210, and brings you 111 hp and 147 lb-ft of torque from its 83 kWh motor. On a full charge you can expect the 500e to take you about 84 miles, making the 500e a great choice for urban and suburban drivers. 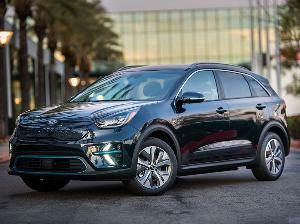 The all-new 2019 Kia Niro Electric gives you 123 MPGe in city driving, 102 on the highway, and 112 MPGe in combined driving. 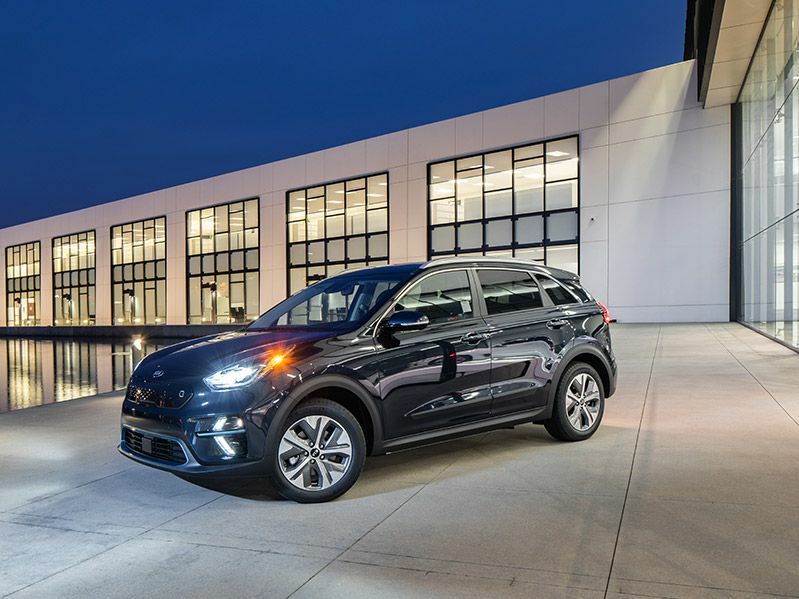 The Niro is conveniently designed as a compact four-door hatchback, provides 201 hp and 291 lb-ft of torque, and will drive up to 240 miles on a full charge. The Niro offers a modern interior design inspired by technology, with blue accent features throughout. 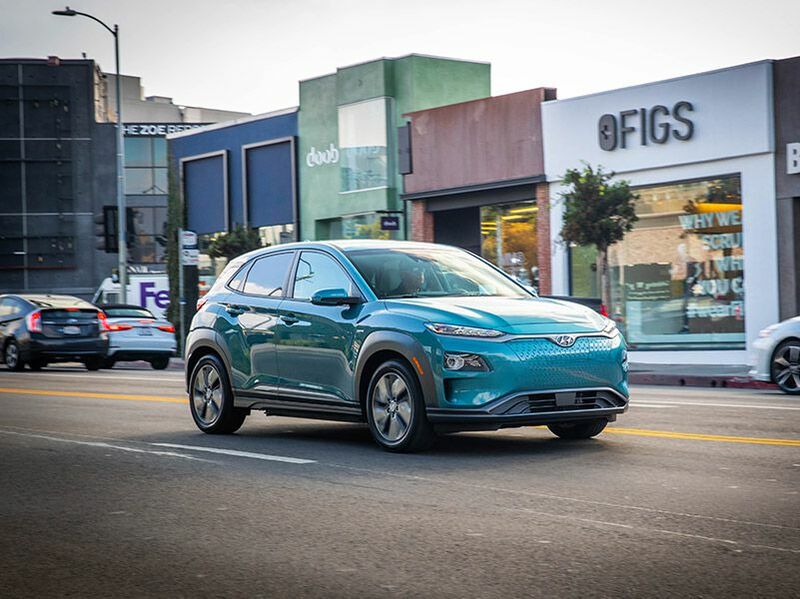 The Niro EV is expected in dealerships shortly, but in the meantime, check out the efficient Niro hybrid and the Niro plug-in (PHEV) hybrid as alternatives. If you want a Kia EV today, consider the 2019 Kia Soul EV, which hs been updated with the Niro drivetrain and offers the same performance as the Niro. The Nissan Leaf was the car that brought EV ownership into the mainstream back in 2011. Now the 2019 Nissan Leaf offers 124 MPGe in city driving, 100 on highways, and 112 combined MPGe. 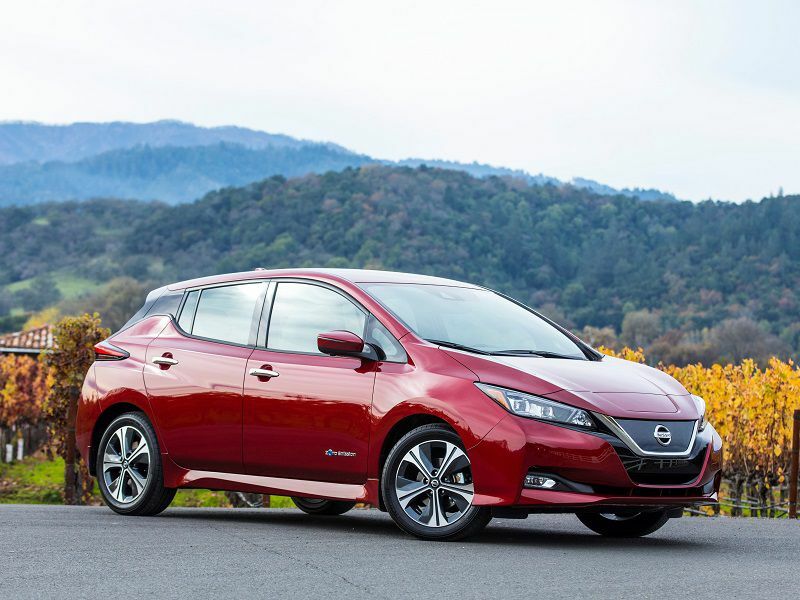 Nissan has updated the Leaf recently, raising its range to 226 miles if buyers choose the new 62 kWh Leaf Plus, or up to 150 miles with the standard 40 kWh Leaf model. Motor power in the standard Leaf is 147 hp and 236 lb-ft of torque, while the Leaf Plus offers additional performance with 214 hp and 250 lb-ft of torque. Like most electrics, all Leaf models use a single-speed direct drive transmission. The 2019 Nissan LEAF starts at $29,990, and the Leaf Plus starts at $36,550. The quirky 2019 BMW i3 is rated to return 124 MPGe in the city, 102 on the highway, and 113 MPGe in combined driving. The total electric range of the i3 is about 114 miles. 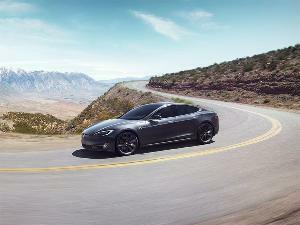 However, the car can be purchased with a range-extender gasoline engine that recharges the battery as you drive. 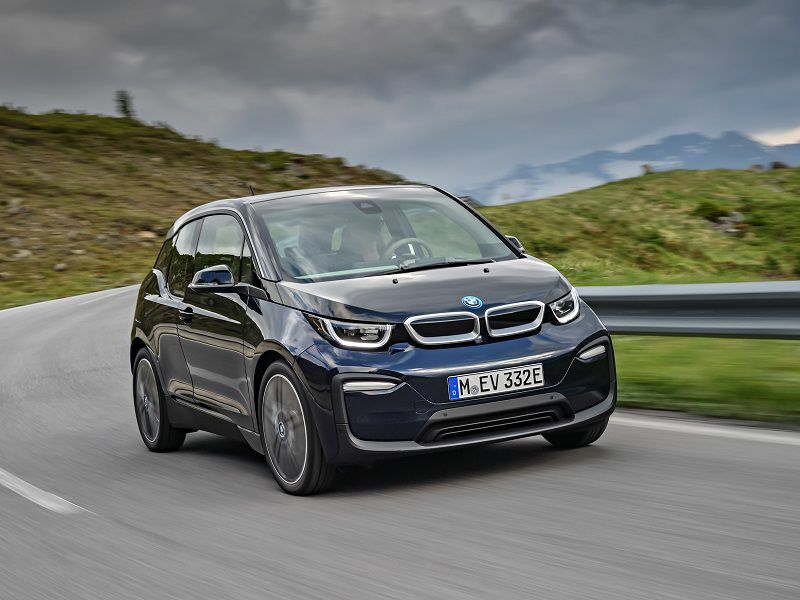 This feature boosts the total effective range of the i3 to 180 miles. The electric motor provides all the driving power, and it’s good for 170 total system horsepower and 184 lb-ft of torque. That’s enough to give you very good performance on the street, and the top speed is governed to 93 mph. Inside, the i3 is like a modernist living room, with pleasant wood accents and a clean design. The 2019 BMW i3 starts at $44,450. The Honda Clarity is available as a plug-in hybrid, a hydrogen fuel cell EV, and as a pure EV. The 2019 Honda Clarity Electric is rated at 126 MPGe in the city, 103 on the highway, and at 114 combined MPGe. The Clarity Electric has a range of 89 miles on a full charge, and accommodates DC Fast Charging as well as Level 1 and Level 2 charging. With DC Fast Charging, the Clarity can achieve an 80% charge in just 30 minutes. 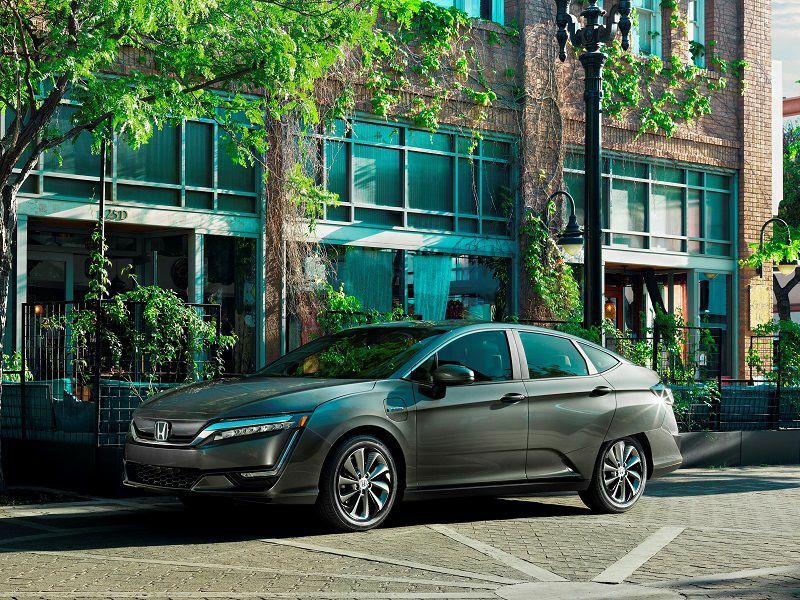 The Clarity Electric motor produces 221 lb-ft of torque, and Honda covers the battery pack with an eight-year, 100,000-mile warranty for your protection. 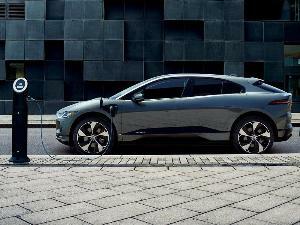 The Clarity Electric sells for $36,620, but Honda also offers a 36-month lease at $199 a month, which is attractive. 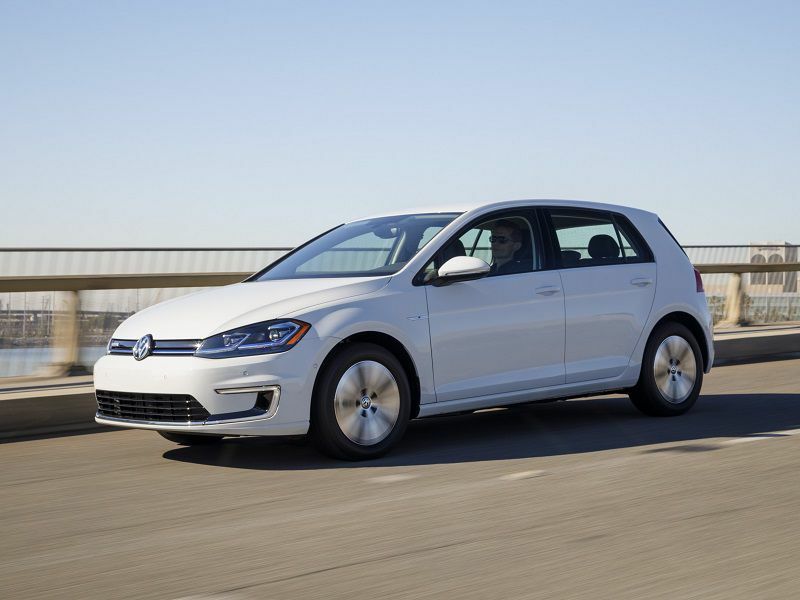 The 2019 Volkswagen e-Golf offers impressive ratings of 126 MPGe in urban driving, 111 on the highway, and 119 MPGe combined. On top of that, the e-Golf is one of the best-driving EVs on the market. Range is better than many other options at 125 miles, while also giving you 134 hp and 214 lb-ft of torque. The 2019 e-Golf starts at $31,895, and if you get the SEL Premium trim, it comes with a long list of standard features like adaptive cruise control, automatic climate control, and an integrated navigation system. However, VW also is bringing out its all-new EV architecture vehicles in the next couple of years, so even better things are coming soon. 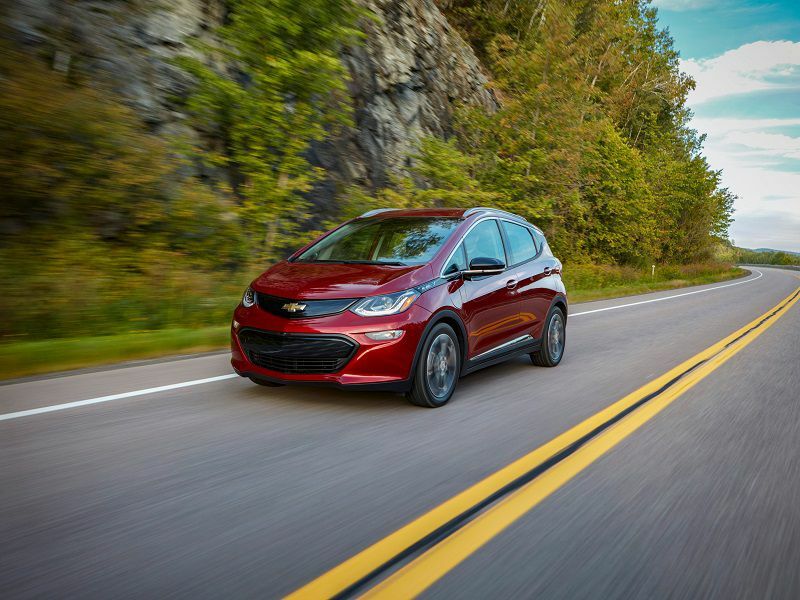 The 2019 Chevrolet Bolt EV is one of the most successful EVs in the industry, and it achieves 128 MPGe in city driving, 110 in highway use, and an average of 119 combined MPGe. 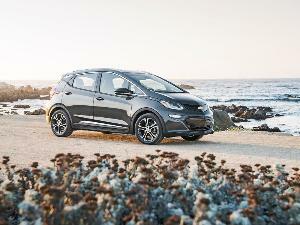 The Bolt is a compact four-door hatchback retailing for $36,620. It’s among the popular choices because of its 238-mile range, which we have tested and found to be easily achievable in real-world driving. The motor in the Bolt is good for 200 system horsepower and a potent 266 lb-ft of torque. That gives the Bolt a 0-60 time of 6.5 seconds, which is better than many sports cars. Additional features available with the Bolt include a large 10.2-inch touchscreen infotainment system and onboard 4G/LTE data connection. 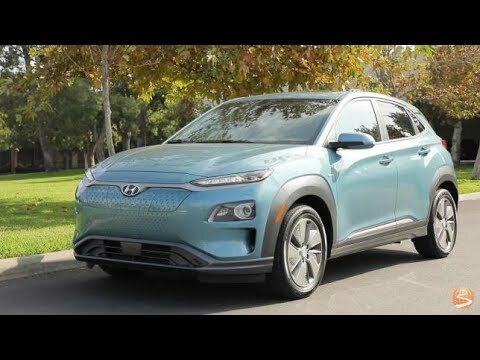 The all-new 2019 Hyundai Kona EV is a compact four-door crossover suv that achieves an impressive 132 MPGe in the city, 108 on the highway, and 120 MPGe in real-world combination driving. With a 64 kWh battery pack, the Kona can travel up to 258 miles on a full charge. The Kona is among the best-looking electrics on the market, and it retails for $36,450. On the performance side, the Kona offers 201 hp and 291 lb-ft of torque. But there’s more going on than that. Safety features like blind spot monitoring and forward collision warning are included as standard equipment, even on the base trim. Higher trims offer leather, LED headlights, and a head-up display. 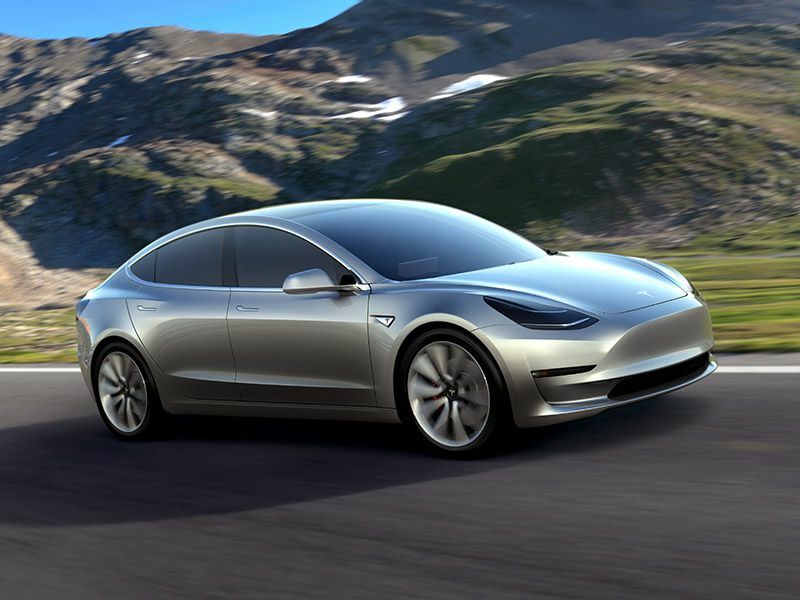 The 2019 Tesla Model 3 Long Range comes in at second place on our list, achieving 136 MPGe in city driving, 123 on the highway, and 130 average MPGe. 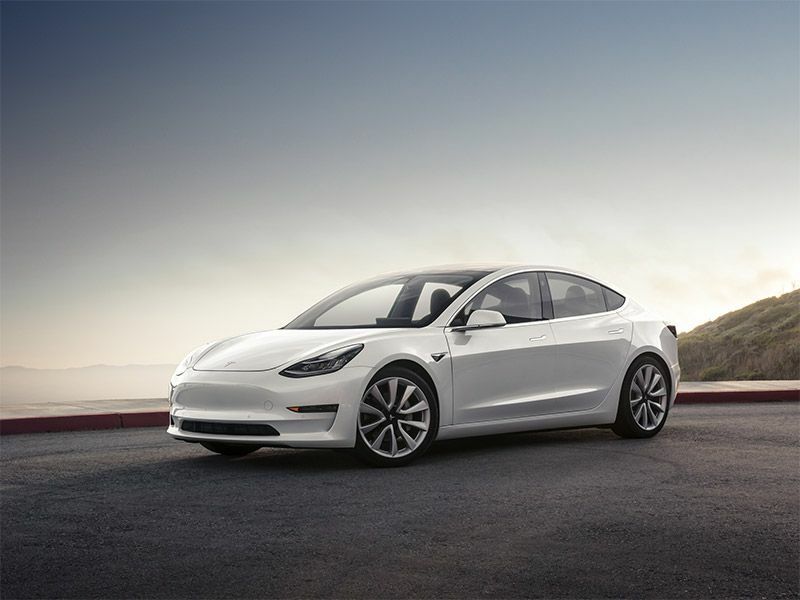 That’s impressive economy, especially when you consider that the Model 3 Long Range has a 310-mile range on a full charge, includes dual-motor all-wheel drive, and accelerates from 0-60 in just 4.5 seconds. If you buy the performance model, the 0-60 time is 3.2 seconds - solidly in supercar territory. The Model 3 received five star safety ratings from NHTSA, and includes full radar coverage for collision avoidance. The interior is unique, featuring one large tablet-style display in the center of the dash. That’s it, there’s nothing else on the dash. The 2019 Tesla Model 3 Long Range retails for $49,900. 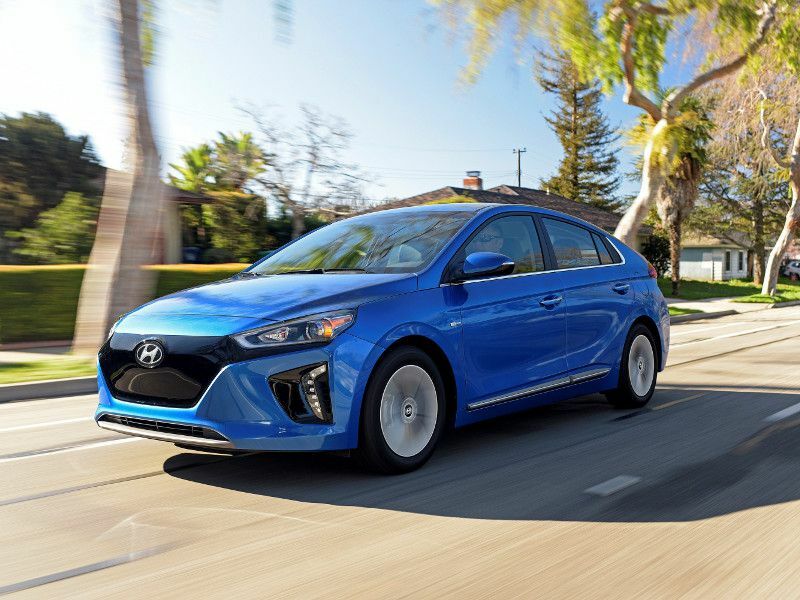 The best MPGe rating is found with the 2019 Hyundai Ioniq EV, which boasts 150 MPGe in city driving, 122 MPGe on the highway, and a combined rating of 136 MPGe. The Ioniq delivers 118 hp and 218 lb-ft of torque, carries a 28 kWh battery, and has a standard range of 124 miles. DC Fast Charge capability is standard on all models, which is a great benefit. The Ioniq is a compact four-door hatchback design, with a smooth exterior shape optimized for aerodynamics. Heated front seats are standard equipment, along with a 7-inch touchscreen infotainment interface in the standard trim and an 8-inch screen in the Limited trim. The 2019 Hyundai Ioniq Electric retails for $30,315.